BioBubble Terrarium Small Animal Habitat Silver 24" x 15.25" x 25",A modular and expandable terrarium for reptiles. BioBubble Terrarium Small Animal Habitat Silver 24" x 15.25" x 25"
The BioBubble Terrarium is a modular animal habitat. Ideal for creating fantastic environments for reptiles, amphibians and small animals, the revolutionary design enables it to be customized for specific applications. Mix and match any BioBubble accessory to create the ultimate terrarium Habitat. Use the BioBubble Activity Pod to create hideaways, exercise stations and other activities for your small animals. It’s the perfect all-in-one playground. CUSTOM BASE COVERS Stylish base covers come in a variety of colors and patterns so users can personalize their BioBubble. 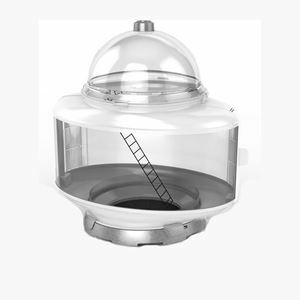 Bio Bubble Terrarium – Small Animal Includes: Terra Base, Cap, Dome, 4 BioClips, Bungalow Deck, Terrarium Riser with 2 Vented Doors, Carbon Fresh Pad and Bedding Tray.